"If you like Chicken Cordon Bleu, you will love this casserole! This is one of my family's favorites!" Mix the corn flake crumbs, Parmesan cheese, and 1/4 cup melted butter in a large bowl, then spread about 2/3 of the crumb mixture into the bottom of the prepared baking dish. Layer half the chicken breast strips over the crumb base, and sprinkle with salt and black pepper. Cover with half the Swiss cheese, then a layer of ham, followed by layers of mushrooms and green onions. Mix the cream of chicken soup and sour cream together in a bowl, and spread the mixture over the green onion layer. Place the rest of the chicken strips onto the soup layer, followed by the rest of the Swiss cheese. Top the casserole with the remaining 1/3 of the crumb mixture. Drizzle with 2 more tablespoons of melted butter if desired. 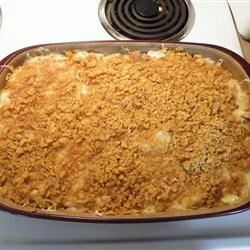 Cover the casserole with aluminum foil, and bake in the preheated oven for 45 minutes; remove the foil and bake until the casserole is bubbling, the cheese has melted, and the crumb topping is brown, an additional 15 minutes. To save time, I buy the fully cooked chicken breast strips and diced ham to use instead of preparing my own. This is a very easy and tasty meal! Will make it again! Was not to my liking! The sour cream and soup sauce was not very good! Sorry!